San Diego Tree Pruning, When is the right time? San Diego, Ca is known for the always sunny and 72 forecast that all of us residents love, but one thing to consider, especially in rural areas like Ramona, or valleys like El Cajon and Poway is that our temperatures can soar to well over 100 degrees at any point from about March until late November. This can make timing your next tree pruning job rather difficult, if you cut your tree’s too early in the season they may not be ready for the heat waves that we encounter, and if you wait too long to prune your trees, a particularly cold night could cause devastating damage similar to the frostbite a human would encounter. 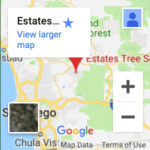 Estates Tree Service has been in business since 1992, based in Ramona and covering the entire county of San Diego, we are familiar with the in’s and out’s of the extreme climate and microclimates that our customers face, we have helped thousands of residents throughout the county to make sure that their tree pruning was timed perfectly and carried out with expert technique. While we may be partial to the idea of being the company that you call for your next San Diego Tree Pruning job, we hope you’ll find this article helpful if you’ve chosen to take on this daunting task by yourself. The right time for Tree Pruning depends on the type of tree you have. The most advantageous time of year for San Diego Tree Pruning will really depend on the type of tree, below we will break down how to time your tree pruning based on the type of tree that you’re working on. Fruit trees must be pruned every year, the ideal time of year would be during their dormant season. Since San Diego generally has pretty mild winters this can range anywhere from November to February, you’ll want to time your tree pruning towards the end of the winter season as this will encourage a quick regrowth cycle, and in the case of fruit trees you’ll see it produce a higher volume of fruits for you to enjoy if you time your pruning later in the winter season. Don’t hold out too long, if you do your tree may start to bloom and the pruning that you do make actually be removing what would become fruit from your trees. In Southern California, we absolutely love our Avocados, and San Diego is a hotspot for both home and commercial growers of this delicious fruit! So how can you keep your avocado tree’s healthy and productive? There are some simple rules you need to follow to make the most of your Avocado trees. First, prune your trees with purpose, avoid over-pruning or under-pruning your trees by being selective in the cuts that you make, remember, the branches will be the future place that your avocados are going to grow, so removing too many will only cause your tree to be less productive. Planning your cuts for the long term will keep your tree healthier and create less work for you, plan out how you want your tree to look in 3, 5, 10 or 15 years, Avocados are generally wide-spreading trees, so planning your tree pruning with room for growth and for the shape that you want will be crucial to the health of your tree, productivity, and appearance. Another thing to consider, keep your tree pruning tools clean! Just like humans, tree’s get diseases and they can spread them between each other, if you use a pair of pruners on a diseased tree then turn around and use them on a healthy tree you’re asking to spread the disease. Aim to prune your avocado trees in late winter, this will promote production in the following spring season. For more great avocado tree pruning tips, check out the California Avocado Commission. Another tree synonymous with Southern California, the Palm Tree. Known for it’s long, skinny body and beautiful green top, the palm tree is a staple nearly every San Diego neighborhood. While many species of palm tree like the Mexican fan palm are not indigenous to the area, they are still cherished and planted throughout the county because of their great looks! To maintain your palm tree you’re going to need to be very active in pruning the tree, this will help promote the growth of your tree, it’s health, and the appearance. Great news, you can prune your palm tree whenever they look like they need it, be very careful not to remove too much of the tree, especially if its young, but if there’s a dead frond or frond hanging too low, you can absolutely prune it as long as you take proper care in doing so. 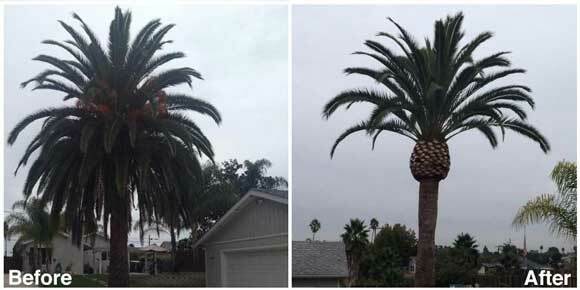 If you’d rather leave it to the team of San Diego Palm Tree Pruning experts, then consider Estates Tree Service, we offer various tree services including palm tree trimming and pruning. Eucalyptus trees can be extremely dangerous if they’re not maintained properly, ensuring a regular tree pruning schedule for your eucalyptus trees will keep them healthy which in turn keeps them safe. Hundreds of people throughout San Diego are injured each year as a result of a branch from a eucalyptus tree falling and hitting them. While most would assume that Eucalyptus trees in San Diego would thrive if they’re pruned in late winter or early spring like our fruit trees, that is NOT the case, in-fact, trimming a eucalyptus tree during colder months can be fatal to the tree. Why is this species any different? Consider its origins, the eucalyptus tree comes from Australia where temperatures are regularly over 100, which is why Summer is the best time for your Eucalyptus Tree Pruning in San Diego. Do not trim your trees during fall. According to Irrigators LLC, if you trim your trees during the fall season will promote the growth of fungi which can cause diseases to kill or damage your trees, wound on your tree’s outer layers will take longer to heal, and having open cuts on your tree’s during cold or frosty periods will lead to the decline in your trees health. At Estates Tree Service we are the Expert San Diego Tree Pruning and Care service that you need to care for your commercial or residential property. We offer 100% Free on-site and No Obligation Estimates, a Satisfaction Guarantee, and we service all of San Diego County including Poway, Ramona, and La Jolla. To request your free San Diego Tree Pruning estimate give us a call today at (760) 440-9138.